The Mediterranean Equestrian Tour’s spring edition resumed this week with Spring MET III kicking off in Oliva Nova, Spain. 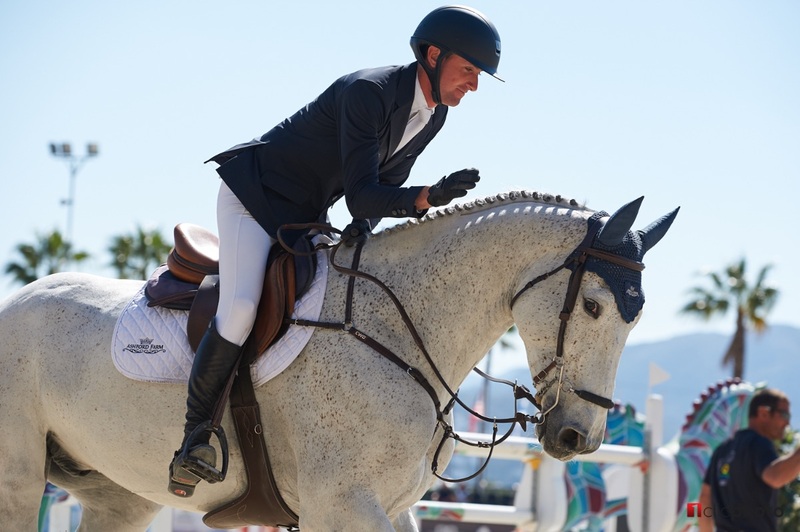 With over 240 riders from 41 different countries attending the three weeks of competition, the first week’s highlight was the CSI2* Grand Prix presented by CHG. With 30,000 Euros in prize money on offer, the class also counted for the Longines world ranking. A total of 50 horse-and-rider combinations lined up on Sunday afternoon for the challenge set by the German course designer Frank Rothenberger, one of the world’s very best in his field. The demanding first round set in the beautiful Oliva Nova ring counted 13 obstacles and 16 efforts and only nine pairs joined the deciding jump-off over a shortened, seven fence track. Maurice Tebbel (GER) on Don Diarado (Diarado x Lord Lancer), Mathjis van Asten (NED) on Yagudin (Berlin x Irco Mena), Michael Hughes (USA) on Baldur 75 (Baloussini x Candidatus), Chloe Winchester (GBR) on Konstop (Fierro Hof Ter Zeedycke x Toulon) and Marit Haar Skollerud (NOR) on Farnell (Carambole x Guidam) were joined by Sören Pedersen (DEN) on Tailormade Sandros S Bella (Sandro Boy x Chacco Blue), Alexander Schill (GER) on Cruising 11 (Crawford 5 x Calato), Mathilda Karlsson (SRI) on Apollonia 23 (Bodegardens Apollo x Bodegardens Capello) and Kathrin Müller (GER) For Kash (For Pleasure x Kashmir Van Schuttershof) to battle it out for the win. With a time of 36.30 seconds in the jump-off, it was Michael Hughes and Baldur 75 that took home the win, pushing Mathijs van Asten on Yagudin down to a second-place finish. Kathrin Müller on For Kash took the third place, while Alexander Schill on Cruising 11 ended fourth and Mathilda Karlsson on Apollonia 23 fifth. Michael, who has worked for Enda Carroll´s Ashford Farm for the last three years, had a fantastic week at Spring MET III with many top placings and a win in Saturday´s Silver Grand Prix before going on to top Sunday’s Grand Prix. “All the horses have been fantastic this week, from the young horses to the more experienced ones. All of them have been so consistent and it means a lot to our team who works so hard to make all this happen,” Michael said after his Grand Prix win. “I thought the course was nice, the time allowed was tight enough but there were a lot of options to make up for it. The course really suited my horse, I could leave out strides and he really likes that. This way, it was easy for me to stay inside the time allowed,” Michael commented on his ride. “He was second in one of the Grand Prix classes here during the last tour and placed eight yesterday in the Longines ranking class. I have been riding him for about four months now and he has come a long way since then. He is so careful and really, really smart – I am very lucky to ride him. I cannot thank Enda enough for the opportunity to ride a horse like him,” Michael said about his winning mount, the 12-year-old gelding Baldur 75. Michael, who has eight horses with him at Spring MET III after competing a total of 14 horses during the previous Tour in February, is a regular at Mediterranean Equestrian Tour. “I love coming to Oliva, it is one of my favourite places to come every year,” he said about the venue. Spring MET III continues next week and runs a total of three weeks, ending on 31st of March. In April the Spring MET 2019 will see its fourth and final part with two weeks of international competitions running from 9th to 21st of April. Click here for full results.